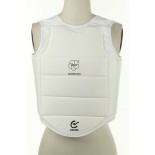 Layered with high density foam padding for impact absorption. Cuff wrist strap with velcro fastener ensures a perfect fit. Designed for maximum comfort and durability using sanded "top grain" leather. 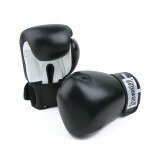 ..
Black synthetic wrist wrap boxing glove with 2” wide wrist strap. Velcro closure on wrist wrap providing maximum protection to wrist and hand. Foam core with cushioned grip bar and tied thumbs. Vinyl outer shell and nylon lining. 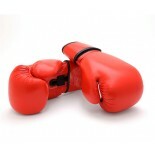 Numerous uses including aerobic boxing, bag work, and sparring. Colors: All Black and Black w/White Palms Size: 6, 8, 10, 12, 14, 16, 18 oz ..
Layered with high density foam padding for impact absorption. Cuff wrist strap with velcro fastener ensures a perfect fit. Designed for maximum comfort and durability using sanded "top grain" leather. Size: 8, 10, 12, 14, 16, 18 oz. Made by Thaismai, Thailand .. Constructed with durable genuine leather. 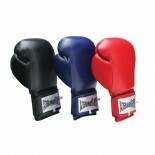 Features cuff wrist strap with velcro fastener for perfect fit. Size: 8 oz, 10 oz, 12 oz, 14 oz, 16 oz .. 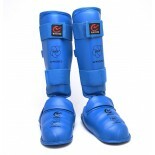 Designed for maximum comfort and durability using sanded "top grain" leather. 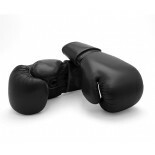 Featuring pre-curved fingers to reduce hand fatigue and a fist-forming grip bar. Made by Thaismai. 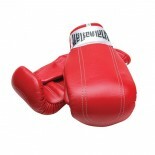 ..
A more economical bag glove from Pakistan, known for their quality leather products. Featuring pre-curved fingers to reduce hand fatigue and a fist-forming grip bar. 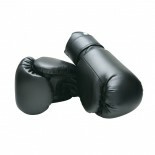 ..
A more economical bag glove from Pakistan, known for their quality leather products. 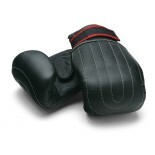 Features pre-curved fingers to reduce hand fatigue and a fist-forming grip bar. ..